Tokyo, Japan - March 10, 2014 - Sony Corporation ("Sony") and Panasonic Corporation ("Panasonic") today announced that they have formulated "Archival Disc", a new standard for professional-use, next-generation optical discs, with the objective of expanding the market for long-term digital data storage*. Both Sony and Panasonic aim to launch systems with a recording capacity of 300 GB per disc from summer 2015, onwards. In addition, both companies plan to leverage their respective technologies to further expand the recording capacity per disc to 500 GB and 1 TB. The following logo has been designed to represent the "Archival Disc" professional-use next-generation optical disc standard. In recent times, demand for archival capabilities has increased significantly in the film industry, as well as in cloud data centers that handle big data, where advances in network services have caused data volumes to soar. Both Sony and Panasonic have successful experience working on the development of Blu-ray Disc™ technology. 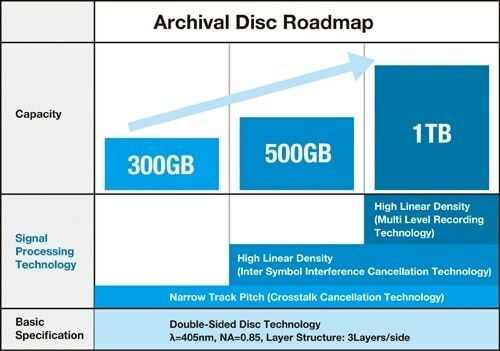 The two companies plan to actively promote this next-generation high-capacity optical disc standard in the professional field in order to offer an effective solution for protecting valuable data into the future. Crosstalk cancellation technology*1 and high-order Partial Response Maximum Likelihood (PRML) signal processing technology*2 have been employed to achieve both larger capacity and higher playback signal quality. *1This technology electrically removes crosstalk from the adjacent tracks that increase as the track pitch becomes narrower, to achieve high-quality playback performance. *2PRML is a signal processing technology that improves reproduction performance by allowing inter-symbol interference. *Company names and/or product names mentioned in this document are trademarks or registered trademarks of the respective corporations. Panasonic Corporation is a worldwide leader in the development and engineering of electronic technologies and solutions for customers in residential, non-residential, mobility and personal applications. Since its founding in 1918, the company has expanded globally and now operates over 500 consolidated companies worldwide, recording consolidated net sales of 7.30 trillion yen for the year ended March 31, 2013. Committed to pursuing new value through innovation across divisional lines, the company strives to create a better life and a better world for its customers. For more information about Panasonic, please visit the company's website at http://panasonic.net/ .